(Phys.org)—A species of lizard, the Argentinean black and white tegu (Salvator merianae), has been discovered by a combined team of researchers from Brazil and Canada, to cause its internal body temperature to rise over the course of several months, during mating season. 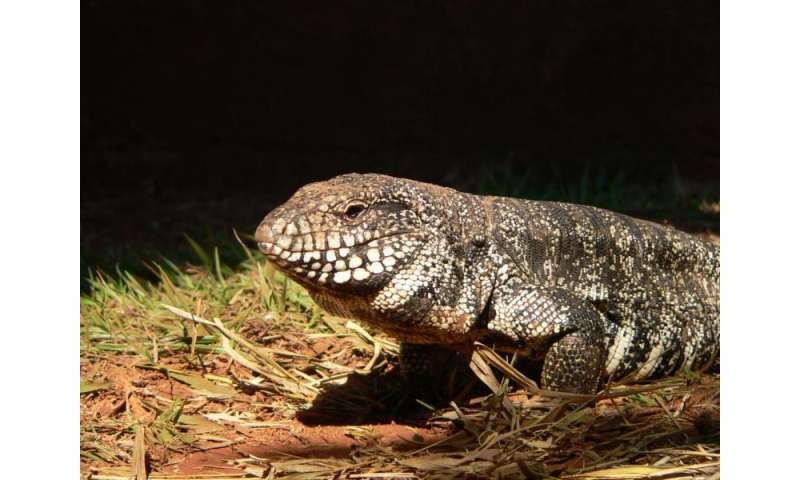 In their paper published in the journal Science Advances, the team describes their study of captive tegu, what they found regarding body temperature and offer some ideas on how the cold blooded reptile manages to heat itself. One of the main differences between birds and mammals, and amphibians, reptiles and fish, is the ability to self-heat. Those that cannot are known as ectotherms, creatures that get their heat from the environment. 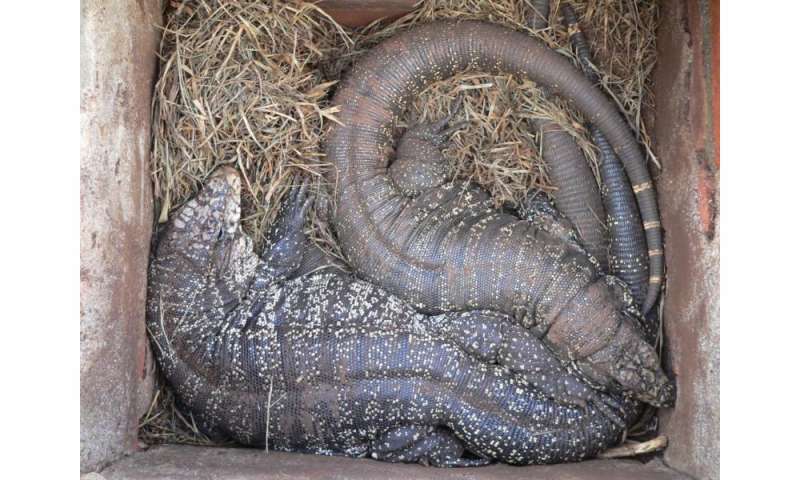 Lizards fall into that category, but one species, the black and white tegu appears to be breaking the rules—the research team found that they cause their bodies to be from 4 to 10 C° warmer than the environment in which they are situated from approximately September to December—the mating season. As the researchers note, tegus tend to spend a lot of time in the sun during the day, warming their bodies. At night, they go into burrows where it is warmer than outside, but still, as the temperature in the burrow drops, so too does the body temperature of the lizards—but not so much during mating season. In addition to an increase in heat, the lizards also had an increased heart and breathing rate, which may offer a clue regarding how the supposedly cold-blooded creature is able to make itself warmer—a faster metabolism could explain the increase in heat, the team suggests, but so could a secreted hormone that forces tissue to work harder than normal, or organs that have a heat producing element. The researchers readily acknowledge that they do not know how the lizard heats itself, but plan to keep looking—finding the answer might help to better understand how warm-bloodedness developed in other organisms. To find out if the lizards were somehow sequestering heat from sunlight during the day, the researchers withheld both food and sun from several of the lizards, but they remained warmer than their surroundings nonetheless—it might be, the research group suggests, because warmer bodies help both genders more successfully reproduce. They note that the rise in temperature became more pronounced as the lizards emerged from their burrows in the morning, prime mating time. With some notable exceptions, small ectothermic vertebrates are incapable of endogenously sustaining a body temperature substantially above ambient temperature. This view was challenged by our observations of nighttime body temperatures sustained well above ambient (up to 10°C) during the reproductive season in tegu lizards (~2 kg). This led us to hypothesize that tegus have an enhanced capacity to augment heat production and heat conservation. Increased metabolic rates and decreased thermal conductance are the same mechanisms involved in body temperature regulation in those vertebrates traditionally acknowledged as "true endotherms": the birds and mammals. The appreciation that a modern ectotherm the size of the earliest mammals can sustain an elevated body temperature through metabolic rates approaching that of endotherms enlightens the debate over endothermy origins, providing support for the parental care model of endothermy, but not for the assimilation capacity model of endothermy. It also indicates that, contrary to prevailing notions, ectotherms can engage in facultative endothermy, providing a physiological analog in the evolutionary transition to true endothermy.